Create large scale craft and décor projects with this stylish laser cut stencil. Designed for DIY home décor projects, this jumbo wall stencil features a decorative quatrefoil pattern that can be used with ArtMinds Décor or Chalk paints to create your own personalized décor accents, from furniture and wall accents to textiles and rugs. DIY Home Quatrefoil Wall Stencil by ArtMinds® is rated 4.3 out of 5 by 7. Rated 4 out of 5 by KAFer from Love the Quatrefoil Design! I’ve tried this stencil on a canvas, but have yet to use it on the wall. It’s quite large which is helpful and seemed to work just fine on a flat surface. I can see how holding it steadily enough on a wall would be challenging. It is on the thin side, but cleaned up very well with soap and water and a magic eraser. Rated 5 out of 5 by Joey LC from Easy to use Purchased this Stencil for an Accent Wall in Our Master Bedroom, the stencil worked Great an it was easy to use. Rated 5 out of 5 by Llphelps from Very nice stencil Great quality, beautiful pattern. Lots of use out of it so far. Rated 5 out of 5 by Crafty In MN from So easy to apply to a wall Not difficult to move and paint doesn't go through. Makes a nice wall paper effect. Rated 4 out of 5 by TBaca from my project turned out great! 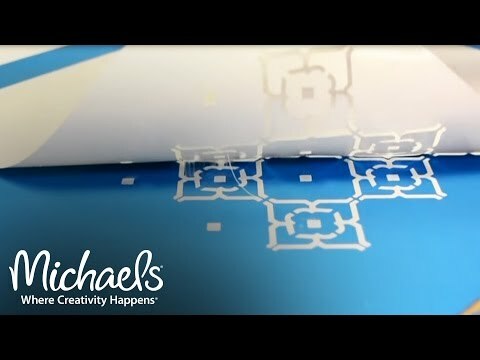 I will agree with the last review that this is not the easiest of stencils to use but... I planned on using 2 stencils, measuring and using a level (a lot). I knew this was not going to be easy but worth the time put in. Probably not for a beginner unless you are a stickler for precision. My wall was 102" wide. I took my time. Worked in 2 hr increments and it turned out fabulous. Would recommend to anyone who has patience, time, and a flare for style. Rated 2 out of 5 by Lynn from I expected more The openings (design spacing) in this stencil are not the same dimensions from 'quatrefoil' to 'quatrefoil.' Meaning that if I line the stencil up on itself one or two repeats over (rather than only using the guide lines) the design doesn't line up and I end up with double thick and mis-aligned lines on the new section. Tomorrow I get to repaint my wall the base color and start over using ONLY leveled grid lines that I draw myself and hand-painting in the gaps that will be left in the design. I would not purchase any repeating stencil design of this brand again. I would, however, have been happy with the stencil if it weren't so critical to align it consistently over a large area.